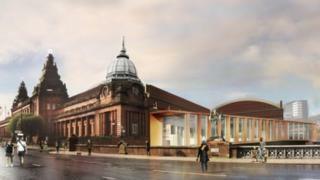 A £4.5m lottery grant has been awarded to transform Glasgow's Kelvin Hall into a major museum facility. The site will revamped to provide public access to 1.5 million pieces from Glasgow's civic collection and Glasgow University's Hunterian Museum. The venue will also house the National Library of Scotland's Scottish Screen Archive and have a new role as a cultural, research and training centre. Kelvin Hall housed Glasgow's transport collection up until 2010. It has since been moved to its new home at the Riverside Museum. The Kelvin Hall development is a joint project between Glasgow City Council, Glasgow Life, Glasgow University and the National Library of Scotland. One of its primary aims is to create safe, secure and publicly accessible museum storage for the internationally-important Hunterian and Glasgow museum's collections. About 1.5 million objects, currently stored in various locations around the city, will be relocated to the redeveloped Kelvin Hall. Among the many exhibits is the only surviving complete suite of interiors by Charles Rennie Mackintosh for Mrs Cranston's Ingram Street tearooms. The new development will allow these to undergo conservation works in public view. The National Library of Scotland's Scottish Screen Archive - with more than 100 years of Scottish history on film and video - will also be housed at the venue. Plans are also being developed for a new digital portal so that all three partners will be able to bring their collections together online. Colin McLean, head of the Heritage Lottery Fund in Scotland, said: "The Kelvin Hall is a hugely popular building, much-loved by the people of Glasgow and beyond so it is fitting that the lottery-playing public have had a hand in securing its future. "This is a groundbreaking project which brings together civic, university and national heritage collections for the first time in the UK." Throughout the revamp, the Kelvin Hall will continue to house sports facilities which will be upgraded as part of the scheme. Cllr Archie Graham, deputy leader of Glasgow City Council and chair of Glasgow Life, said: "The Kelvin Hall is a historic Glasgow institution which has been home to world-class sporting events and housed our outstanding transport collection. "This ambitious project will breathe new life into what is already a vibrant museums quarter with Kelvingrove, the Hunterian and Riverside museums nearby."